This NASA Marshall Space Flight Center image shows on-orbit functions for the reusable X-37B space plane, now under the wing of the U.S. Air Force. The U.S. Air Force's secretive X-37B space plane program has passed another milestone: Its latest mission marked one year in orbit this week. The reusable unmanned X-37B space plane, flying what the U.S. military calls the Orbital Test Vehicle 3 (OTV-3) mission, began its second flight on Dec. 11, 2012, launching atop an Atlas 5 rocket from Florida's Cape Canaveral Air Force Station. The winged X-37B spacecraft in some ways looks like a miniature version of NASA's space shuttle and measures 29 feet (8.8 meters) long and 15 feet (4.5 m) wide. It has a payload bay about the size of a pickup truck. The X-37B in orbit today is one of two versions of the vehicles to fly so far. It was built by Boeing's Phantom Works Division in Seal Beach, Calif., and can fly long space missions thanks to its solar array power system. This SPACE.com infographic depicts the X-37B Orbital Test Vehicle is an unmanned space test vehicle for the USAF. See how the unmanned space drone works here. As of Friday (Dec. 13), the spacecraft has logged a total of 592 days in space during two missions. A different X-37B craft spent 469 days circling Earth during the OTV-2 mission, also landing Vandenberg in June 2012. Military officials have not disclosed when the OTV-3 mission might end. They have, however, hinted that the X-37B may not land in California. Instead, it might touch down on the space shuttle landing strip at NASA's Kennedy Space Center in Cape Canaveral, Fla., near the place where it left Earth. Though it is currently performing secret experiments for the military, Boeing officials have said the vehicle could potentially fly cargo missions to the International Space Station. 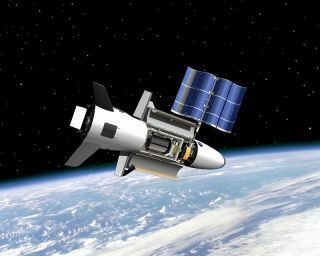 The aerospace company has also indicated that X-37B could evolve into larger spacecraft, a version called X-37C, which could ferry astronauts to the orbiting outpost. X-37B wasn't always in the hands of the military. NASA originally used the plane as an experimental test bed, but when funding for the project ran out in 2004, the vehicle was turned over to the Defense Advanced Research Projects Agency, or DARPA. Then in 2006, it was passed to the Air Force.